A gentle coastal landscape, mountains, impressive gorges, wild rivers and wide plains – the northern Cilento area offers a variety of attractive hiking trails. They are only part of what awaits you during your 'journey' with hiking guide Leonardo Ricciardi. The Cilento’s north is home to a large number of agricultural enterprises. Their work, their products and their traditions characterize local cuisine. 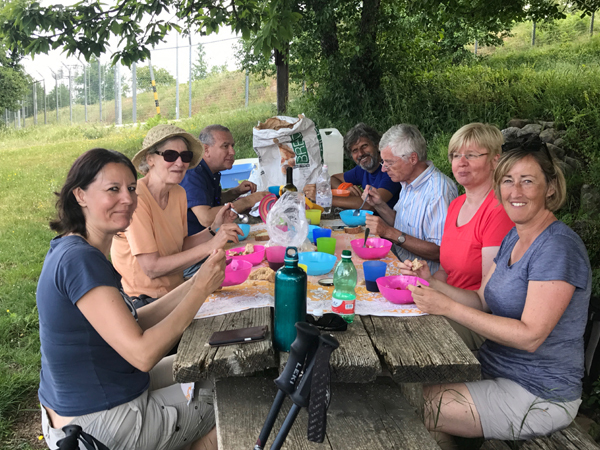 Delicious buffalo mozzarella, artichokes, yellow Capaccio tomatoes, chickpeas from Cicerale, excellent autochthonous wines… Winegrowers, old farm houses and local cheese dairies will 'cross your paths' and add culinary to your hiking delights. Would you spend holidays in the northern Cilento without stopping at Paestum to have a look at the ancient temples? 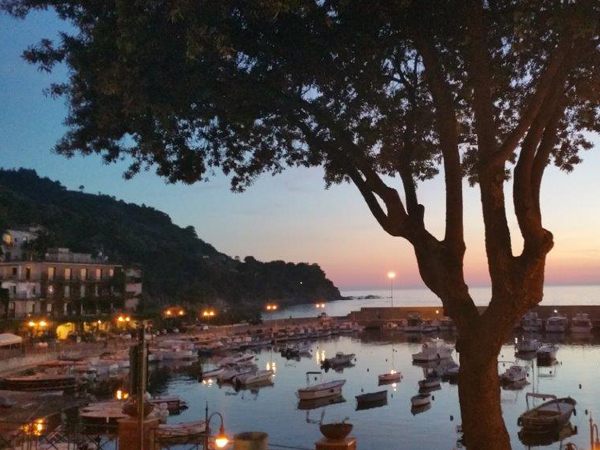 Stories, monuments and personalities – the Cilento has got them all. Leonardo, your hiking guide, knows where to find them and will show you 'faces' of the Cilento which are not described in any travel guide. … is appealing Hotel Antonietta in the heart of San Marco di Castellabate. In the early 1950s, it was the first tourist accommodation in town; in a typically warm-hearted Cilento-way, the hotel still welcomes guests from near and far to its 25 rooms today. From some of the rooms and from the beautiful roof terrace with loungers you have got a view of the sea, which is only about 200 m from the 3-star hotel. The double and single rooms include TV as well as en-suite bathrooms with WC, bidet and shower. WLAN is available in the bar and restaurant areas. Gianfranco is both manager of the hotel and chef of the hotel’s restaurant. In the evenings, after returning from your hiking tours, his traditional cuisine and terrific fish dishes will delight your taste buds. It was early in life, during his times as a boy scout, that Leonardo Ricciardi from Salerno discovered his love for nature and for hiking. So it came as no surprise that Leonardo, who has got a degree in sociology, quickly made his passion a profession. He is a guide of AIGAE (Associazione Italiana Guide Ambientali Escursionistiche), an organization which attaches great importance to the protection and preservation of nature and environment. Since 2013, he has been president of Outdoor Campania, an association which organizes tours to the Cilento, amongst others. As a hiking guide, Leonardo looks for and values places which have remained original, authentic. That is why he feels a strong bond with and a deep affection for the Cilento, its nature and its people. Day 1: Arrival and welcome at Hotel Antonietta in San Marco di Castellabate. 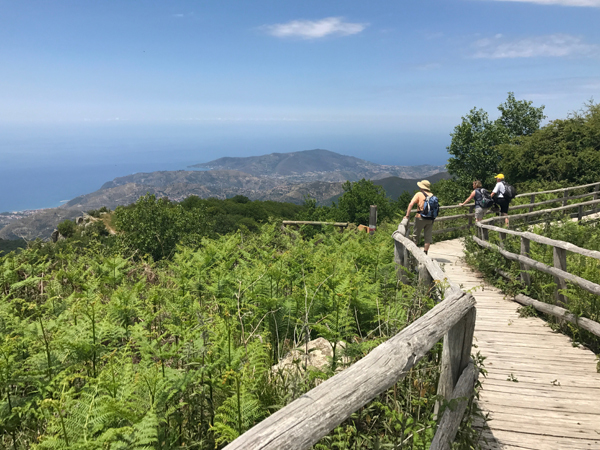 The opening of your week of hiking through the northern part of the Cilento is a circular route starting from San Marco di Castellabate up to Monte Licosa. First it is through olive groves that you go, but soon a marvelous panorama of the mountain village of Castellabate and of the Cape of Palinuro opens up before you. On your way up, you pass three old coastal watchtowers and finally you have reached the top of Monte Licosa (323 m). You then follow an idyllic path down to the maritime wildlife park of Punta Licosa. The famous cape of the sirens is shrouded in legend. Leucosia is said to have sought death there as Odysseus seemed unimpressed by her enchanting song. On your way to the Cape, you pass by the remains of an ancient beacon, a signal for seafaring people, and the dancing trees – pines bent and twisted into their current shapes by strong winds. From Punta Licosa, you and Leonardo follow the coastline back to San Marco. 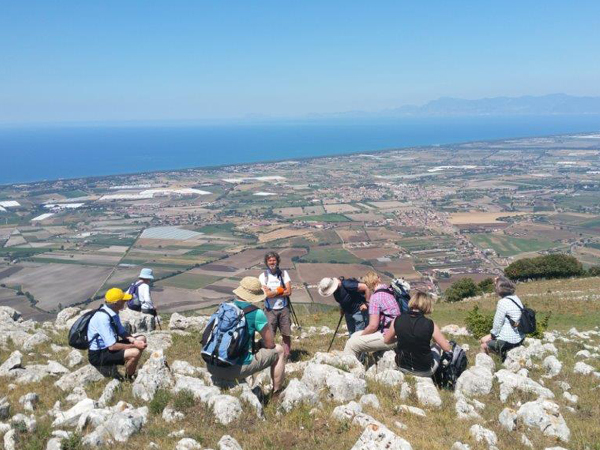 Today’s hiking tour starts at Capaccio and takes you along the crest of Monte Soprano. At your feet lies the wide plain of the Sele river – the empire of water buffalos, artichokes & Co. In the distance you spot the outlines of Monti Lattari above the Amalfi Coast. The first part of this tour is interesting from a geomorphologic point of view, but it is rather challenging due to the steep incline. Your efforts, however, are rewarded with a terrific panorama. The tour continues on to the ruins of Capaccio Vecchio. This town was founded in the 9th century, but was completely destroyed around 1400 by the troops of King Ferdinand. Then up you go, through pine woods, macchia and holm oak woods, to Polveracchio at an altitude of 900 m.
In the afternoon, you can visit the former Greek town of Paestum with its well preserved temples and archaeological museum. Afterwards, you are welcomed at Fattoria Cavallo in Capaccio, where a degustation of its home-made products is scheduled. The organic enterprise keeps goats, sheep and cattle, amongst others, and is known for its goat cheese. This tour to star-shaped Monte Stella, a tour rich in panorama, starts off, with a partly steep ascent, between Mercato Cilento and Serremezzana. What you behold from the crest is wonderful: Punta Licosa, the bay of Ogliastro, Agropoli, Alento valley and Monti Alburni. And – you 'dive into' the history and geography of the region: The name "Cilento" is strongly linked to the Alento river and derived from the corresponding term „cis alento“ (this side of the Alento). On your way to the top, you pass Contrada Pietra della Mulacchia, a huge, solitary rock which reminds you of a meteorite. From the top of Monte Stella with its well-known pilgrimage church, you have got a sweeping view – as far as the Isle of Capri and the Cape of Palinuro. 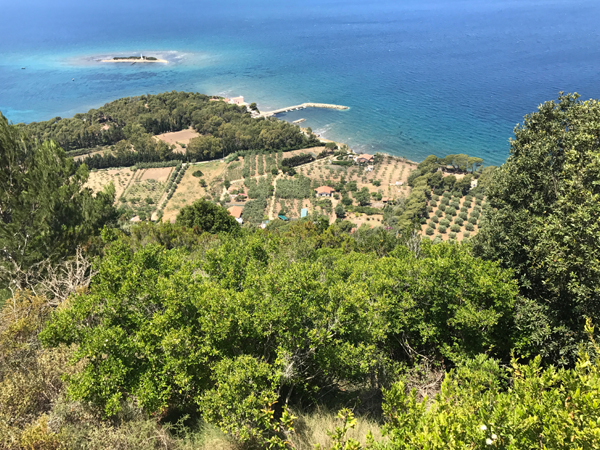 Take in this fantastic Cilento panorama, before descending to San Mauro Cilento, where Cooperativa Nuovo Cilento is based, which is known for its excellent olive oil. The afternoon is dedicated to the Neapolitan philosopher Giovanbattista Vico. There is a small museum in his honor in the village of Vatolla. Vico’s most important work is „Scienza Nuova“, which made him one of the founders of cultural sciences. There is no hiking today; this is your day off. However, should you be in the mood for a small excursion, you might accept hotel manager Gianfranco’s invitation to take part in a boat trip along the coast to Punta Licosa. Today you are going deep into the Cilento National Park, because the hiking tour starts at the village of Felitto, which is located on a rocky outcrop. Gole del Calore is a narrow gorge which the Calore river cuts through. Lovers of nature really get their money’s worth in this place: dense woods, lush, blooming vegetation and high limestone rocks, which seem to conceal this gorge and have, for centuries, protected and preserved this special habitat, which is home to a large variety of animals, the protected species of otters, for example. It is one of nature’s works of art – „Ponte di Pietra Tetta“, a natural bridge formed by the erosion of huge limestone rocks. Another stop on your way is „Chiana Re Vaddi“. Climbing onto the rocks in the middle of the river rewards you with a very special view of the gorge. It is also the ideal spot for a short break and for cooling off (your feet) in the Calore river. After leaving the gorge several kilometers further on, you first spot the reddish rocks of Costa di Magliano, later on Monte Gelbison – the „holy mountain“ – and Monte Cervati, the highest mountain in the Cilento. A Masseria, a farmhouse, is where you stop for lunch and where you enjoy a Cilento dish of the season prepared by the landlady. After lunch, should there be some time to spare and should you be interested, the ladies are happy to show you how the traditional fusilli from Felitto are made. 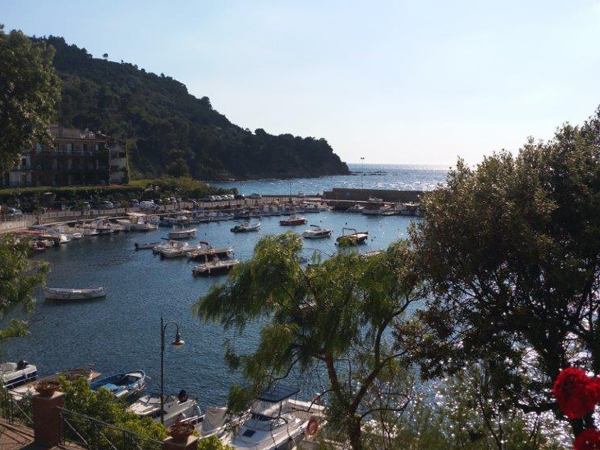 Picturesque Trentova bay south of Agropoli is the starting point for the last tour of this hiking week. The first ascent takes you onto a ledge above the bay, where a terrific coastal panorama awaits you. And coastal panorama is what accompanies you on this tour. Depending on its current, the sea at your feet takes on the most dazzling colors: from turquoise to emerald green to cobalt blue. Enveloped by the fragrance of Mediterranean macchia, Aleppo pines, strawberry trees and agaves, you hike along the coastline. The gentle sounds of the sea are your steady companion. After several kilometers, you and Leonardo reach Contrada San Giovanni. The Contrada at Punta Tresino used to be a village, which was built in this place in the 17th century. Today it is home to Azienda San Giovanni. The small family enterprise counts among the Cilento’s excellent winemakers and invites you to degust its wines, including some delicious, creamy buffalo mozzarella. Fortified, you can then start on the last part of the tour, which takes you through pine woods to Lago near Santa Maria di Castellabate. Required: Good physical condition is required/strongly recommended for our tours. In general, the walking distance is 4 to 6 hours. This tour offer is, unfortunately, not suitable for persons with mobility impairment. Should you have any questions about this, our customer service will be glad to answer them. Double room: starting at 55 Euro per person and day including half board. Single room: starting at 65 Euro per day including half board. Cilentano GmbH, Ludwig-Eckert-Str. 10, 93049 Regensburg, Tel. : 0941/567646-0, Fax: -1, E-Mail: info@cilentano.com.